My thoughts on The War on Drugs don’t differ much from those expressed in nyctaper’s review of the previous night, but I do think some things bear repeating. Nine times out of ten — more like 95 times out of 100 — worthy bands who toil in the trenches don’t make it. One thing doesn’t go right or another. Maybe there’s a lack of commitment on someone’s part. Or a lack of confidence. Or, in most cases, a lack of pure dumb luck. We’ve posted a lot of recordings of this band over the past few years not because we thought one day they’d be able to way-sell-out three nights in a row here in New York, which they just did, but because we believed they were worthy. As a fan, your biggest hope always ought to be that the band you’re rooting for makes it. For Adam Granduciel, who toiled for over a year creating his magnum opus Lost In the Dream, it didn’t yet seem to have sunk in that his band had. He showed a bit of nervousness before kicking off the opening number, “In Reverse”, but after that, this show unfolded like the victory party it was meant to be. 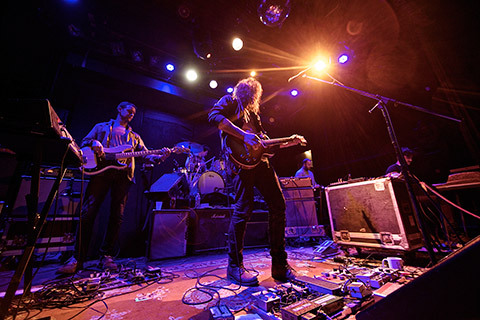 Compared to night one at the Bowery Ballroom, the band was looser and more poised, playing one song after another as easily as “Suffering” transitioned straight into “An Ocean In Between the Waves”. Just as heavily-produced album tracks like “Under the Pressure” shone as rendered live, so too did re-arranged versions of the band’s classics like a slowed-down “Brothers”. With the bevy of personnel at his command, including a saxophonist, the band’s more complex numbers took on a Destroyer-like caste at times (we’ve recorded WoD opening for them). Granduciel makes that work, too, being the kind of musician who can add complexity without letting it turn to overindulgence. Normally when you can hear a crowd screaming at the stage between songs it’s mindless heckling; if you listen closely to this recording, what’s being hurled at Granduciel are compliments on the album. This was that kind of show, right through Granduciel acknowledging the fakeness of encores, asking for the lights to go up some so he could read the lyrics to John Lennon’s “Mind Games” (streaming below) a bit more clearly. The War on Drugs may be critical darlings now, but this is isn’t overnight success. This is it being done the old fashioned way. The kind that lasts. I recorded this set from my usual spot in the venue with Schoeps MK5 cardiod microphones and a stereo soundboard feed provided by house engineer Kenny. The sound quality is outstanding, marred only slightly by light static during two songs. Enjoy! If you enjoyed this recording, PLEASE SUPPORT The War on Drugs, visit their website, and buy Lost In the Dream from Secretly Canadian. This recording sounds beautiful. Thanks! And, yes….I am purchasing the new LP. So glad y’all made it to this show to preserve it. You’ve captured a band on top of their game. Sound quality is stunning as usual. What a glorious recording, what a glorious new album. Thanks NYCTaper, got to know the band through your site a few years ago. Bought every record, seen a show when they were in Belgium, bought some T-Shirts. Great, great band. Thanks again for this. Hey Bart, its been a long time! And glad to see you’re still visiting us. Thanks for supporting the War On Drugs these many years. This album is truly the payoff. Hi. The links to this show and the other WOD show don’t seem to be working at all. Thanks for posting them. I just tested all three links on the 3/20 show. They work fine. Each takes you to a Hightail page, all of which have remaining download capacity. Weird. I still get nothing, using Chrome and Explorer. Thanks for the kind words, but one note, this recording is not a “bootleg.” This was permitted by the band and the venue — part of the reason it sounds much better than recordings that aren’t made with that kind of permission.